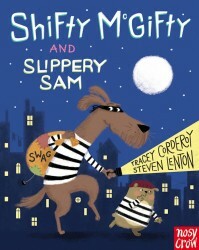 Shifty McGifty and Slippery Sam are two hapless robber dogs who decide on a career-change after one bungled burglary too many. Tracey Corderoy’s accomplished rhyme trips off the tongue and makes the message that honesty is the best policy as light and fluffy as a Masterchef’s soufflé! This funny, quirky story, deliciously dished up by debut artist, Steven Lenton, is full of depth of detail and colour, which little ones will pore over time and time again – and the two robber dogs are adorable comic characters! A real treat – especially for dog-lovers everywhere – young and old. The rhyming couplets demand enthusiastic participation, and the illustrations are as light and fluffy as a good sponge… Slips down a treat.